About 40 minutes southeast of Lucca by car lies the village (borgo in Italian) of Sant’Andrea di Compito. 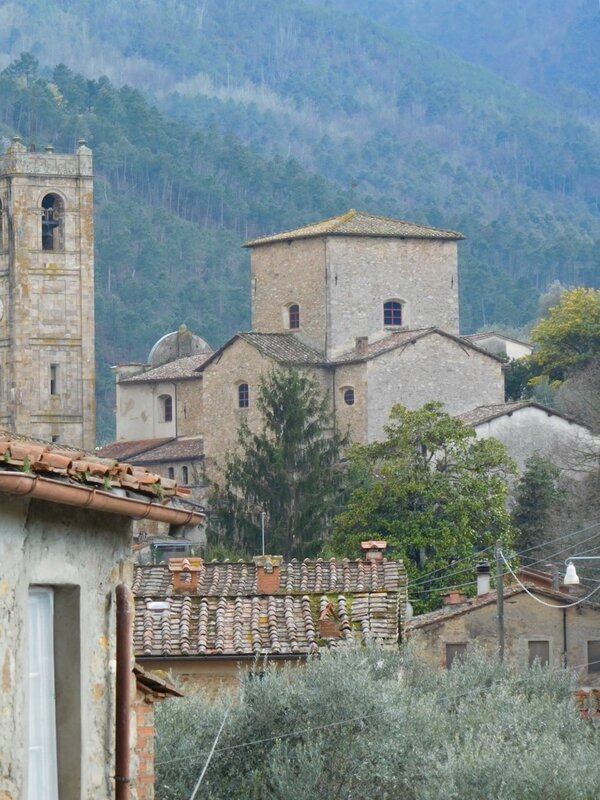 The village is known for its Medieval charm and for an annual display of camellias (camelie in Italian), which marks the beginning of spring in this region. Recently I, along with new friends Jennifer and Gillian from Lucca Italian School, spent a lovely early spring day here. The village is easily reached by bus from Lucca and - per fortuna! - our visit fell on one of the weekends of the Antiche Camelie della Lucchesia festival. Camellias grow above an old stone wall in Sant'Andrea di Compito. Winding up the gently sloped streets we passed ancient churches, a tiny chapel (cappellina), an 11th century signal tower (where the severed heads of criminals were once displayed in an iron basket above the door), beautiful vistas, and an old cemetery where the grave markers gave hints about the history of this area (including one with the names of two men killed on the same day during WWII - a moving reminder of the very real effects of a not-so-long-ago war). There are also villas that are hundreds of years old, small springs and creeks running through (and under) the village, beautiful stone walls, pretty houses, old wells, olive groves and, throughout the village on this spring day, beautiful camellias in flower. Camellias are not native to Italy; they were brought from the orient by Italian trader/merchants in the 1800s. In the time since, they have thrived and become one of the best loved blossoms in the area around Lucca - so much so that each year, on weekends from mid-March to early April, there is the Antiche Camelie della Lucchesia event. During these weeks camellias in bloom can be seen not only in the village of Sant’Andrea di Compito but also in the gardens of the spectacular villas that lie north of Lucca (best known are Villa Torrigiani, Villa Mansi, and Villa Reale). What a great excuse for peeking into these beautiful gardens and villages! Camellia come in many varieties. Best known are the ornamental ones with their delicate flowers in pinks, whites, reds. During the festival there is a beautiful display of cut flowers in a variety of colors in the cultural center in Sant’Andrea di Compito (camellia bushes are also sold there) along with information on the history of camellias in Italy and Europe. A mapped walking route guides visitors through the village and describes the important buildings, sights, and some history. Along the way camellias can be seen in gardens large and small, along the stone walls of walkways, and beside many streets. There are also art exhibits, churches to visit, the signal tower to climb (for great views over the plains of Lucca) and a whole village to discover. In addition to ornamental varieties, the camellia family of plants is also used to make tea - white, green, oolong, and black. In the Antica Chiusa Borrini, a walled enclosed area where tea-producing camellias are raised along with flowering species, we learned about the cultivation of tea in Italy and how various types of tea are grown and processed and about the use of camellia oil in skin and hair products. The Borrini family was among the early collectors of these beautiful flowers and, in 1990, a Borrini descendant began the cultivation of tea here. Fascinating! Waking back down the hill, we came across a small outdoor kitchen with a wood-fired oven and an old stove. The kitchen shed sat on a corner across from a house and next to an olive grove. The owner was busy trimming olive branches, and his wife came over when she saw us and explained how they use their outdoor kitchen. On Wednesdays, they bake cakes in the wood-fired oven (which they also use for pizza). The stove, which is also wood-fired and has a large grill rather than burners, is used for toasting bread for bruschetta and simmering sauces. Meeting friendly locals who enjoy sharing their stories, and being able to understand when they speak to me in Italian, opens the door to so many unique and interesting experiences. For me, this is travel at its most rewarding! This little village is worth a visit at any time, but is especially beautiful when the flowers are in bloom.